Addictions: Uncensored History of the Blues Podcast, T.B. Kills. | Pulp and Circumstance, Juiced. Addictions: Uncensored History of the Blues Podcast, T.B. Kills. As any of you who have read P&C since its beginnings will know, humble blogger adores her the blues; she also adores Mike Rugel, the creator of the downright brilliant Uncensored History of the Blues podcast. The latest episode, T.B. is Killing Me, features blues tracks–mostly from the late 1920s and into the 1930s–about the deadly disease tuberculosis, which most often attacks the lungs. 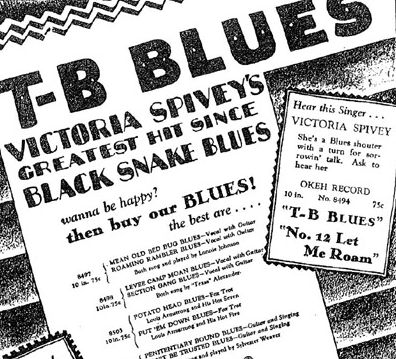 The podcast features Sonny Boy Williamson, Victoria Spivey, and Sleepy John Estes, among others. This entry was posted in Addictions, blues archive, jwolf and tagged uncensored history of the blues. Bookmark the permalink. ← Delicious Drip: It Will All End in Tears.